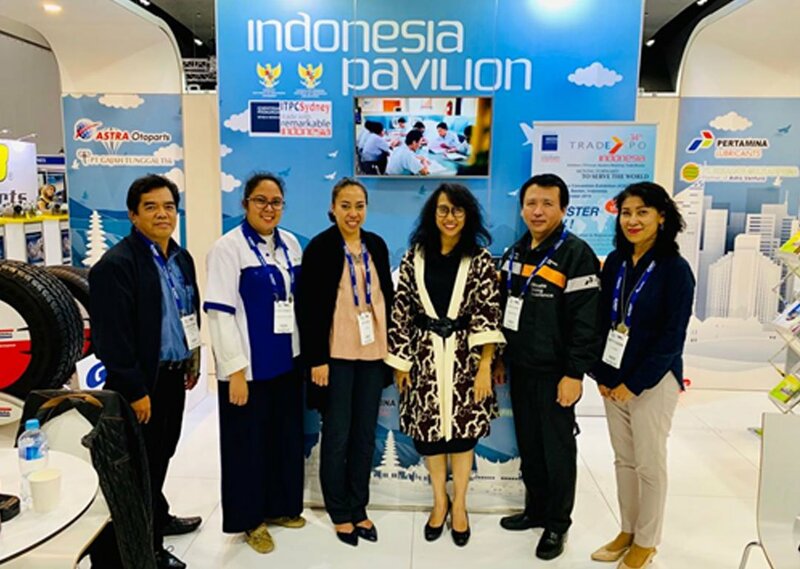 Melbourne, April 6th 2019 – PT Pertamina Lubricants was one of four representatives in the Indonesian Pavilion booth in the largest automotive industry exhibition in Australia, Australian Auto Aftermarket Expo 2019 which was held on April 4-6 2019 at the Melbourne Convention and Exhibition Center (MCEC), Australia. Besides Pertamina Lubricants, the other Indonesian automotive companies participated in the Australian Auto Aftermarket Expo were PT Gajah Tunggal Tbk, PT Rekadaya Multi Adiprima, and PT Astra Otoparts Tbk. along with 400 participants from other countries, including Castrol, Schumacher Electric, Philips Automotive, Pro-Kit and Repco Limited. Pertamina Lubricant’s participation in this exhibition is expected to increase the lubricants exports to Australia more significantly which is in line with its mission in expanding Indonesian lubricant market abroad. This exhibition had successfully introduced and increased brand-awareness of Pertamina Lubricants to the Australian market. Indonesia’s participation in the Australian Auto Aftermarket Expo was initiated by the Sydney Indonesian Trade Promotion Center (ITPC) with the Republic of Indonesia Embassy (KBRI) Canberra and the Consulate General of the Republic of Indonesia (KJRI) Melbourne based on the rapid growth of Indonesian automotive product exports to Australia. “Many thanks to the ITPC and Indonesian government that has invited and sponsored Business Automotive Solutions as Pertamina Lubricants Authorised Distributor in Australia in the Australian Auto Aftermarket Expo to promote Indonesian lubricant products to the Australian market and create potential transactions and collaboration among exhibitors,” explained Andry Wijaya, Managing Director of BAS. Furthermore, Head of ITPC Sydney, Ayu Siti Maryam, also stated that ITPC Sydney together with the Trade Attaché of the Indonesian Embassy in Canberra and the Indonesian Consulate General in Melbourne have agreed to increase the promotion of Indonesian automotive products, including increasing Indonesia’s participation in Australian Auto Aftermarket Expo 2020.